i think i’m safe enough posting this, as far as i’m aware my dad doesn’t know about this blog. this is his xmas present. it took ages to do and i was pretty sick of it by the time it was finished, although i do think it’s gorgeous, if a little short. no stats. the yarn is a bfl/tussah silk blend (natural colours) which i spun from the fold, hence the speckly appearance of the silk, as the silk was streaked through the top (lol, i’m sure there’s a technical term for it) so it would appear in clumps during spinning. i found spinning from the fold a complete pita. it seemed to be sooo much slower than my usual semi-worsted spinning from the end of the top. 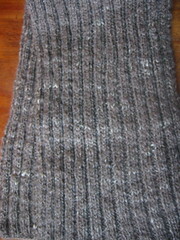 i wanted to try it because the first scarf i made seemed excessively dense. i wanted as much softness as possible, and hoped that using a method that supposedly incorporates more air should be more economical as i only had 200g to work with. i managed to get into a real mess to start with, absolutely no consistency in the wpi and just not getting it at all. i got some help on spinningfiber, my biggest problem being putting in too much twist for a thick yarn. practise certainly helped, but i can’t say i was particularly enjoying it even at the end. i’d line up a dozen or so staple-length-handfuls which helped keep the momentum going, as joining in every couple of minutes was bugging me, but i never really came to terms with it. the knitting was very straightforward. just a 2x2 rib. 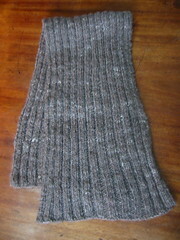 i’m definitely getting faster at combined knitting. i love the way the variation in the weight of the yarn comes out in the knitting, making gentle undulations in the line of the ribbing.